Perched between the Mallory Square and Harbor in Key West, Florida is the Ocean Key Resort & Spa, one of the top rated hotels on Duval Street. It boasts 19th century clapboard houses that lined on little quaint streets used by bicycles - the preferred mode of transportation. 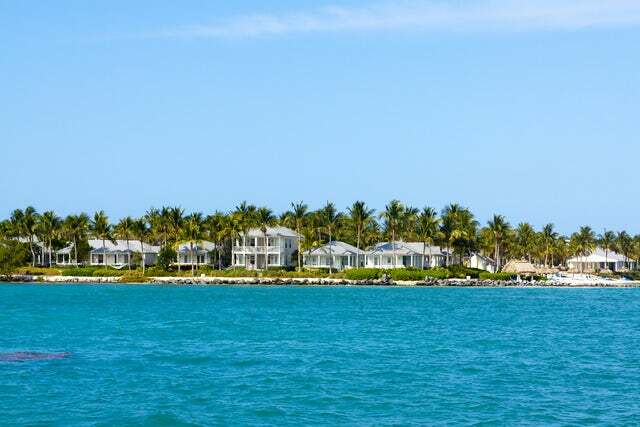 Perched between the Mallory Square and Harbor in Key West, Florida; you will find the Ocean Key Resort & Spa, one of the top rated hotels on Duval Street. It boasts 19th century clapboard houses that are lined on little quaint streets used by bicycles - the preferred mode of transportation. This breathtaking Florida spa resort in Key West captures the essence of Key West island resort living with oceanfront hotel rooms that inspire and energize, all overlooking the placid waters where Gulf of Mexico meets the Atlantic Ocean. The picture perfect Ocean Key Resort and Spa is reminiscent of the idyllic oceanfront resort living. The accommodation at the Ocean Key Resort is divided into two - the guest rooms and the suites. The Guestrooms are further classified into Partial Ocean View Guestrooms with 350 square feet, free Wi-Fi, whirlpool tub bathroom, a queen size bed and the view of the Duval Street and Gulf of Mexico; and the Deluxe Oceanfront Guestrooms with a king bed and a jacuzzi tub in addition to the facilities found in the Partial Ocean View Guestrooms. The suites vary in size from 600 to 900 square foot. They all feature king-size bed and a sleeper sofa and have the view of the Gulf of Mexico. The one bedroom harbor suite has a private balcony. Guests to the resort can opt to get additional packages that include; a Full Day of Reef Fishing, a Seaplane Trip to the Dry Tortugas, and a Jet Ski Tour. For great dining experience, you have three options. You can dine at the Hot Tin Roof Restaurant which is ideal for Romantic Dinners, the Sunset Pier that is great for romantic evening drinks, and Liquid Lounge Restaurant & Bar which is great for breakfast as you soak in the morning sun. Ocean Key Resort & Spa is ideal for events such as corporate meetings, weddings, staff retreats, romantic getaways, anniversary celebrations, honeymoons, etc. If you want to outsource your wedding planning, the wedding planning team at the resort will do a fabulous job. Of course the resort will require that you make reservations well before the date of your event since it is in great demand. We will do this for you. Just contact us today and we will get you packing.